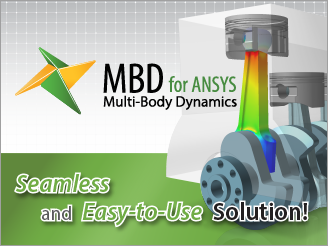 MBD for ANSYS (Multi-Body Dynamics for ANSYS) is an add-on module for ANSYS that is used to simulate the transient behavior of a mechanical assembly in motion and is developed by FunctionBay. Physical tests, empirical values, or just outright guesses are often used. But this is expensive, time consuming, and often inaccurate. Transient FEA can calculate the loads. But difficulty of use, slow calculation, and poor convergence are barriers to using transient FEA. Automated and Intelligent Load Transfer MBD for ANSYS can generate accurate loads and provides automated and intelligent loadtransfer process. MBD simulation outputs are transferred as loads on a FEA model automatically!